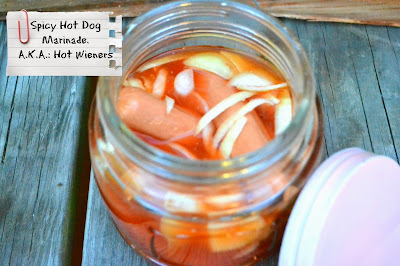 This recipe for "Hot Wieners" aka "Spicy Hot Dogs" is an easy marinade for your next cookout. I like to make a batch of this up a few days before I want to cook them so they get nice and spicy! It is a fun addition to the traditional hotdogs, and your guests will ask you where you bought them at! Little do they know you spiced them up yourself! You can certainly play around with the quantities in this recipe to adjust the hotness level. The recipe came to me in an old community cookbook and when I read it, I couldn't wait to try it. As with many old recipes a few of the ingredients didn't list exact quantities, so I have tweaked it a little for you to adjust for that. Feel free to play with it a bit yourself! I usually use 2 different kinds of hot dogs for my cookout so I can tell the difference from the spicy and the regular. I personally use the Hebrew National brand hot dogs for my non spicy hot dogs, and I use an all beef hot dog from another brand such as Ball Park for the spicy. This is for 2 reasons. the regular hot dogs need a great flavor too, and it makes it easier to tell my guests which ones are which since they look so different. This recipe makes a marinade for 3 lbs of hot dogs (That is 3 regular sized packages). I cut it by 1/3 if I only want to marinade 1 package. I leave out the optional hot pepper, but feel free to pop one in there if you are brave enough! In one gallon sized jar with tight fitting lid, or other sealable container place hotdogs, onions, and optional sliced pepper. In large sauce pan over medium heat stir together vinegar, pepper sauce, salt and cumin. Bring to a boil then remove from heat. Pour Vinegar marinade over hot dogs to cover. Seal jar/containier. Let stand in refrigerator for a few days before cooking hot dogs. Behind the scenes: Note to Self: Next time, do not dry off hands from the marinade on a towel and then rub your eye. You WILL regret it. Stop and wash your hands first.